I Have Faith, So Why Didn’t God Answer My Prayer? Does unanswered prayer mean you don’t have enough faith? What does God’s Word say? 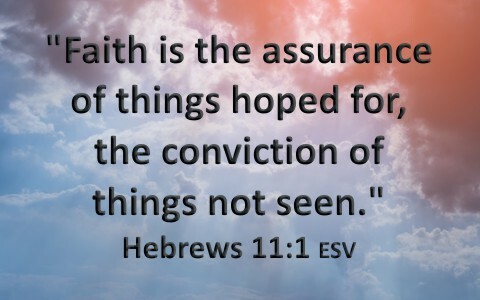 The Bible says that “faith is the assurance of things hoped for, the conviction of things not seen” (Heb 11:1), so faith is an assurance we have hope in and the conviction of the things we do not yet see, like we believe in Jesus Christ without ever having seen Him. That takes faith, but faith is not what you conjure up or work yourself up to. It must be the Object of your faith that you are assured about and not the faith that we can muster up ourselves by means of the human will and mind. That’s not faith…that’s wishful thinking, so faith, being a gift of God (Eph 2:8), is not from us but from God, so when we pray in faith to be healed or to mend a broken relationship or even to avoid financial ruin, it’s not our faith that does miracles but God Himself, so if we are not receiving the answer to our prayers, there is a reason for it, and it’s probably not a lack of faith but a lack of being in the will of God. I have actually heard some preaches say, “You’ve got a miracle in your mouth. You can speak things into being that are not yet,” and when I heard it, it actually reminded me of a Bible verse where it says, “For he spoke, and it came to be; he commanded, and it stood firm” (Psalm 33:9), but the “he” wasn’t a man, it was God. It’s similar to when “God said, “Let there be light,” and there was light” (Gen 1:3), so these “word of faith” preachers who believe you can speak things into existence need to understand that the will of God is more important than the will of the so-called “faith-healer.” When Jesus healed people, He would frequently tell them to “say nothing to no one,” and when large crowds started to gather, He would sometimes slip away. This is just the opposite of faith healers today who display their work on a public stage and broadcast it on television and the Internet, as if they are the source, however God’s definition of faith is radically different from those who are showboating their “gift of healing.” The Bible says that “faith is being sure of what we hope for and certain of what we do not see” (Heb 11:1 NIV), and it’s not what you speak or think that has power. The Apostle Paul prayed three times to have his thorn in the flesh removed but God said, “My grace is sufficient (or enough) for you, for my power is made perfect in weakness.” Therefore I will boast all the more gladly of my weaknesses, so that the power of Christ may rest upon me” (2nd Cor 12:9). When these fake healers claim to have the power to heal, they are not biblical because God alone heals. Even the Apostle’s miracles were always attributed to God and never once to man, so faith healers do this to rob God of His due glory and ascribe it to themselves. When Jesus once said, “Be it according to your faith,” what did He mean and what was the context? On one occasion, “some people brought to him a paralytic, lying on a bed. And when Jesus saw their faith, he said to the paralytic, “Take heart, my son; your sins are forgiven” (Matt 9:2). On another occasion, “a woman who had suffered from a discharge of blood for twelve years came up behind him and touched the fringe of his garment, for she said to herself, “If I only touch his garment, I will be made well.” Jesus turned, and seeing her he said, “Take heart, daughter; your faith has made you well.” And instantly the woman was made well” (Matt 9:20-22), so it seems that the person’s faith was responsible for their healing, but is this really what Jesus is saying? Does the person’s faith exist outside of faith in God? Is the person’s faith enough to heal? At least not without the involvement of Jesus because Jesus was still the one healing them, and healed them because they had faith in Him, not because they had faith in themselves. If they had faith in themselves, then they wouldn’t have even come to Jesus, but they had faith enough to know He could heal them…and He did…and it was done according to their faith…their faith in Him! Many have been so confused over the centuries about James statement that “faith by itself, if it does not have works, is dead” (James 2:17), but James is not in disagreement with Paul (Eph 2:8-9) but actually supports what Paul was writing that we are saved, not by works, but for works (Eph 2:10), so saving faith is revealed in doing good works such as these mentioned in Matthew 25:34-40 and James 1:27. Works don’t save us but a saved person naturally works the work of God. Later on, James puts it this way, “[is] anyone among you sick? Let him call for the elders of the church, and let them pray over him, anointing him with oil in the name of the Lord” (James 5:14) and “the prayer of faith will save the one who is sick, and the Lord will raise him up. And if he has committed sins, he will be forgiven” (James 5:15), but again, James is not saying that if you can conjure up enough faith in yourself you can be healed. It is the “prayer of faith” to a God Who can heal that can erase any sickness or illness, but truly, it is only the Lord Who can heal and if you have enough faith that He will, He might, but there is no guarantee anywhere in the Bible that claims God will answer every single prayer and heal every person who prays for it…in faith or a faith that wavers. It depends on what God’s will is and not how strong or weak our faith is. If God doesn’t seem to be answering your prayer, think about this; maybe God wants to keep you humble and totally dependent upon Him (which is His will) or He wants you to be able to comfort others who are going through the same thing…or God’s will is hidden and we don’t really know why God didn’t answer the prayer specifically, but even unanswered prayer is an answer, and sometimes, unanswered prayer is the best answer of all. One final thought; we may never know why God didn’t answer our prayer, at least this side of the kingdom, so rest in this: “The secret things belong to the LORD our God, but the things that are revealed belong to us and to our children forever, that we may do all the words of this law” (Deut 29:29). Whatever is God’s secret counsel is none of our business, but what is our business to know is what is “revealed to us and to our children” by God. I can live with that. How about you? Read more about faith and healing here: Is Healing All About Faith? Previous post: What Does The Bible Say About The Use Steroids?